Savory, spicy and addicting! This recipe for Thai shrimp vegetable pasta is made with vegetable noodles to provide a healthier way to enjoy Thai flavors with a boost of nutrients in each bite. Are you looking for a fast and healthy meal that shines in the flavor department? Look no further, Thai cuisine is where it’s at! The delicious and flavor-packed curry pastes combined with sweet coconut milk add the perfect amount of spices to each bite of succulent shrimp. This recipe can be quickly brought together for a satisfying weekday meal. I made sure to load each forkful with nutrient dense vegetables that get tossed in the spicy sweet curry sauce. All of the exotic savory flavors in this Thai-spiced shrimp dish will leave you craving for the next big bowl! If you haven’t heard of the spiralized vegetable noodle craze happening in the food world, it’s time to hop on board! I must admit, I was a skeptic at first, and of course, nothing beats real pasta, but for a nutritious, quick hitter, this is the way to go. Luckily the incredible flavors in the sauce help to infuse quickly into the vegetable noodles for a comforting and tasty dinner. Equipment: With just a few turns of spiralizer, vegetable noodles are made in a flash. I’m obsessed! Trusty Tools: If you don’t own one of these fancy tools mentioned about, just break out a cutting board and your chef’s knife. Slice the squash and carrots in wide enough strips so that they are not too thin and won’t break easily during cooking. I recommend slicing the vegetables lengthwise in ¼” wide slices, then in ¼” wide strips. Of a vegetable peeler works well for long thin strips of carrots. Check out those colorful vegetable noodles! A quick 5-minute saute in a large pan will give you tender yet slightly crisp vegetables. Cutting the vegetables into curly shapes adds a more interesting texture and volume to the noodles, and it’s fun to make! Have you ever seen Forrest Gump where Bubba names off hundreds of ways to prepare shrimp? I don’t remember if he mentioned shrimp in Thai curry sauce, but it should definitely be on the list! There are many prepared curry pastes that you can purchase depending on how spicy and flavorful you like your curry. For this recipe, I used Thai Kitchen red curry paste . This particular red curry flavor is very spicy. You can always add small amounts at a time to a full can of coconut milk until you reach the desired level of spiciness. The fresh shrimp get cooked right in the luscious red curry sauce in just a few minutes. It’s time to bring everything together! The tender, succulent and sweet shrimp compliment the creamy and spicy red curry sauce. The squash and carrot noodles lighten the dish, and the purple cabbage provides a refreshing cooling crunch. A little sprinkle of chopped cilantro, some grated lemon zest and a freshly cracked black pepper and dinner is ready! There are only three simple components to the dish; vegetable noodles, curry sauce, and shrimp. All of these combined create a stellar exotic meal that will transport you to Thailand. The best part is they all cook so quickly, so you can dig right in! 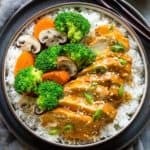 What are other ways do you enjoy cooking with curry? I’ve got a tasty coconut curry meatball recipe for an Asian twist on a traditional Italian classic. I’d love to hear how you spice up your dinner! What is the red curry paste? If you are looking to create an authentic Thai curry flavor in your dishes, an easy way to do that is with pre-made curry pastes. Red curry is commonly a combination of red chilies, garlic, shallots, lemongrass, sugar, kaffir lime galangal, coriander seeds, cumin and cardamom spices, ground into a fragrant paste. The balance of spicy, savory, tangy and sweet notes are essential in Thai cooking. You don’t need very much curry paste. A little bit goes a long way for flavor impact and spiciness. Creamy coconut milk and a touch of fish sauce balance all of the flavors to create a delicious sauce. If you want more of a mild curry, yellow or massaman are great choices. Savory, spicy and addicting! Thai-spiced shrimp with vegetable noodles provides a healthier way to enjoy exotic flavors with a boost of nutrients in each bite. Prepare the vegetable noodles by using a spiralizer or slicing the squash lengthwise into ¼” slices, then cut into ¼” wide strips. A vegetable peeler can also be utilized for the carrots to cut long thin strips. Set aside. In a medium sized pot, saute the red curry over medium heat until fragrant, about 30 seconds. Add the coconut milk, maple syrup and fish sauce. Stir and allow to simmer for 5 minutes until hot. Taste curry sauce and adjust seasonings as desired. Season shrimp with 1/4 teaspoon salt and 1/8 teaspoon black pepper, toss to combine. Add shrimp to the pan with curry sauce and cook over medium heat until no longer translucent, about 2 to 3 minutes on each side. Turn off heat. In a separate large saute pan, heat one tablespoon oil over medium-high heat. Add vegetables and cook until crisp tender, occasionally tossing, about 4 to 5 minutes. To plate- Divide the vegetable noodles evenly into bowls. Add shredded cabbage in each bowl. Top with shrimp and some curry sauce. Garnish with chopped cilantro and black pepper. Enjoy! See, now this is a perfect substitute for the nights when I’m about to order in! This would also be a great contribution to this month’s Shine Supper Club. I hope you’ll consider joining us! Thanks Sarah, I just submitted my recipe! I really liked this dish. I recently ordered a KitchenAid attachment to spiralize vegetables. I used the fine blade but I think this recipe would have been better with the extra fine blade so I ordered it from Amazon. Should the spiralized vegetables be warm? I cooked according to the instructions and they weren’t really warm. Also, I added an extra tablespoon of red curry but would have liked it to be spicer. How much more should I add without going overboard? Finally, I was snacking on multigrain pita chips and hummas while I made this. I was thinking about baking wontons and having a more Thai-based dip. What would you suggest for an appetizer? Thanks Kay! The vegetable noodles are crisp-tender but should be warm, don’t be afraid to turn up the heat a little next time, but you don’t want the vegetables mushy. If you like it spicy, try adding some chili paste instead of more curry to balance the flavors. I think that’s a great idea to make baked wontons! I’ve done that before, search “tuna tower” on my site for how to make the crisps. I like spring rolls (fresh or fried) or chicken satay as an appetizer. I loooove Thai food, but it’s always served with rice or noodles (which I don’t eat) – this dish is right up my lane!!! I love a veggie option!!! I can’t wait to make it! Yay Keisha! Can’t wait to hear what you think 🙂 I’m loving veggie noodles! Just perfect! I substituted shrimp for tofu and it is a great meatless Monday dinner! I’ve been a silent lurker ever since the Food Blogger conference in Salt Lake City. I love almost every single one of your recipes and food photos. This by far has been my favorite recipe, thanks! I made this for company Saturday night. It was easy to prepare and everyone loved it! I love your recipe’s Jessica. Yay! Thank you so much for your feedback Anne 🙂 I love sharing recipes with you! I just made this and it was simple to prepare, healthy, and had amazing flavor! I used my Ninja IQ to spiralize the veggies and chop the cabbage which made the prep seamless. I followed the recipe exactly as written with one small addition of topping the final diagnosis with a few shakes of crushed red pepper (I like spicy) – it was DELISH! !